When anyone places their Stampin' Up! 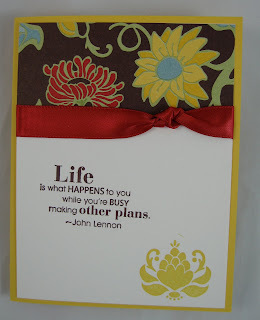 order with me (email, phone, or on-line) I include a blank hand-stamped card. I love making them, and I think it gives the recipient a little something. I was using the Greenhouse Gala DSP (#117167) and Friends Never Fade stamp set (#120618) to make a card for my Saturday Technique & Tool Usage class and have fallen in love with this paper and stamp set. So, I figure why not make their 'thank you for your order' card using the same products? It will show them an additional item to make with the same supplies. Pretty thrifty, huh? I love products that have more than one use. I hope that they like this card, as much as I do. Thank you for looking.